What is it exactly? It’s built like a notebook, with a couple of sheets of green and magenta construction paper sandwiched between its plastic wings … but it can’t really be opened for writing, and on the opposite wing — the Oakland side — there’s a patent number and the tiny word “bookmark”. Bookmark it is! The side pictured shows a line drawing of Treasure Island complete with the Port of the Trade Winds in the foreground, a three-masted wooden ship and China Clipper seaplane bobbing in the harbor. The other side shows both Golden Gate and Bay bridges from an eastern aerial perspective, the Oakland Hills visible in the background. 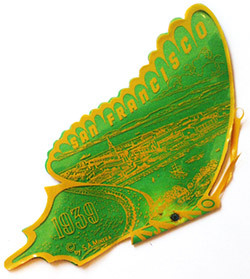 An avalanche of memorabilia was created to memorialize the 1939 World’s Fair at Treasure Island, but though far from being unique, or even especially valuable, it’s still thrilling to hold this little plastic-winged butterfly and somehow feel the 75+ years that have passed since the day it dropped off the assembly line. I’m not really a collector of anything but stories, but this thing really is a tiny treasure. Juliana from outloudradio.org (a Sparkletack listener and fellow radiophile) just thought I’d enjoy this memento of the City of Light, and mailed it in. Thanks, I do indeed. Bits of memorabilia are like windows to the past. It’s a shame that you wrote it’s “far from being unique”, when it’s something truly uncommon these days. Having lived in the city for many years, I have never seen 1939 original memorabilia just floating around.